Reserve Bank of India announced the RBI Office Attendant Result 2018 on 08th February 2018. So, the aspirants who attended the exam on 06th Jan 2018 can check their available RBI Result 2018 For OA and Merit List along with Cut-Off marks @ the main portal of RBI www.rbi.org.in and get further information check out the following information. RBI Office Attendant Result 2018 Corrigendum Finally Selected Candidates in the Bank’s Lucknow Office !!!!! Latest Update (05th October 2018): Reserve Bank of India announced the Corrigendum Finally Selected Candidates in the Bank’s Lucknow Office. Aspirants download them from here. RBI Office Attendant Final Results 2018 Out for Chennai Region!!! 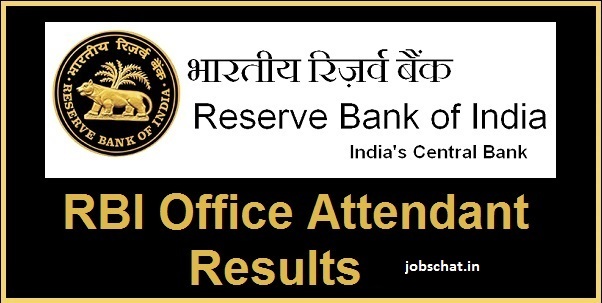 Latest Update(04th September 2018): RBI Office Attendant Final Results 2018 are released in region-wise Check below the links which are placed below. RBI Office Attendant Finally Selected Candidates List ! Latest Update on (23rd August 2018): Reserve Bank Of India Released the Final RBI Office Attendant Merit List of 2017 Recruitment recently with important notice. RBI OA Result 2018: RBI organised the RBI OA Written Exam on 05th Jan 2018 successfully. The Registered candidates have taken the Online Exam and now eagerly waiting for the RBI OA Results. RBI issued this Good News about the Results i.e the RBI Office Attendant Results 2018 will available from Feb 2018. And the Info about RBI Office Attendant Result Date 2018 also intimated and will be in 08th Feb 2018. Generally, it will be available after 40-45 days after the exam date. Due to huge competition, the Bank Officials took more time to evaluate the Answer Sheets of the aspirants and to issue this on web portal @ rbi.org.in. Moreover, the RBI OA Answer Keys also issued for the purpose of the aspirant’s verification. And the candidates can directly raise a query within the insisted time about this official keys and if there is any modification the officials once again modify those respective question solutions and once again releases the Modified RBI OA Solution key. In addition to this RBI Office Attendant Cut-Off Marks, the Merit List also issued in PDF Format where the aspirants can check the selected list for Language Proficiency Test. This Merit List is done based on the statistics of the Previous cut-Off along with present exam attendees along with Top Score achieved in each aspirants category which is not constant. So, the aspirants can check that by entering their name or DOB. Only those aspirants only eligible for next round and dates will be insisted to the eligibles on the main site of www.jobschat.in. Hope the toppers will be given importance during the selection. And the RBI Attendant Resuls 2018 and Scorecards must be given to the Officials in LPT test for verification. So, the Postulates need to check this RBI OA Marks List to count their total marks by adding from each section involved. Sectional Marks also took into consideration at this present RBI competitive level. By using the steps listed can check the score without any chaos. As the RBI Office Attendant Results will be available from Feb 2018 onwards, fast in downloading this because the link will be active for a week after the result announcement. And LPT is done as per the aspirant’s state location wise and that rounds score is also added to this Online Exam score and the final selected list will be issued on rbi.org.in in PDF Format. Definitely, the listed info helps aspirants without searching another site. In addition to this also apply for Latest Bank Jobs in India. On the Home page, on What’s New tab find the updates available. Find and open the available RBI Office Attendant Result available. Then the RBI Office Attendant Results will be displayed on the screen.